KIEV, Ukraine -- Ukraine is bringing charges against Soviet leader Joseph Stalin and his secret police (NKVD) chief Lavrenti Beria for the repression of Crimea’s Muslim Tatar community, the country’s general prosecutor announced on Thursday. 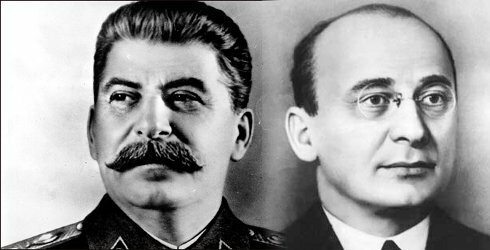 Joseph Stalin and his secret police (NKVD) chief Lavrenti Beria. The investigation, which began in December 2015, centers around events that happened over 70 years ago, when the Soviet Union deported thousands of people from Crimea to Siberia and Central Asia. The deportations followed the Soviet decision in 1944 to regard thousands of Turkic-speaking, Muslim citizens in what was then part of the Soviet federation as enemies of the state. The Ukrainian state estimates that at least 230,000 people were deported, the majority of whom were Tatar, with some who were Greek and Bulgarian. Thousands perished in the hardships. In 2014, Russia took control of Crimea after an armed incursion at a time of political instability in Kiev. Russia has regarded the peninsula as its own territory since, though a majority of U.N. General Assembly members regard Crimea as legally Ukrainian and the annexation as illegal. Crimean Tatar communities have complained of police hostility, home raids and detentions since the annexation. The de facto Russian authorities in Crimea condemned Ukraine’s attempt to posthumously charge Stalin and Beria, and State Committee Secretary Zaur Smirnov called the charges “a mockery of a tragedy,” according to state news agency Itar-Tass. To bring the prosecution, Ukraine’s investigators carried out 53 probes across 52 universities and 67 state libraries, documenting evidence against Stalin and Beria. The prosecutor has also reviewed archives of the mass starvation of ethnic Ukrainians during 1932 and 1933, known as the Holodomor. Since 2006 Ukrainian parliament has regarded the event as a forced starvation of Ukrainians and therefore an act of genocide by Soviet authorities. Ukraine’s pro-EU governments, both of which entered power off the back of popular protests in 2004 and 2014, have revived probes into Stalin’s role in and responsibility for atrocities in the 1930s and 1940s. The pro-Russian Viktor Yanukovych administration, toppled in 2014, regarded the Holodomor and other Soviet-era tragedies, in much less combative terms, considering them collective tragedies for all former Soviet people—the same position Russia takes. Since Yanukovych’s ouster in 2014, Ukraine has set on a course of so-called decommunization. Hundreds of towns, cities and regions are subject to renaming as they bear the name of Soviet, often controversial figures, while symbols such as the five pointed red star or likenesses of Vladimir Lenin if they are presented without a disclaimer of Soviet atrocities. However, both Stalin and Lenin are growing in popularity in neighboring Russia, in the meantime. Moscow has openly celebrated Soviet military and scientific achievements under Russian President Vladimir Putin. Recent polls in the country have found a majority of Russians approve of Stalin and Lenin.